A common garden biennial or perennial species grown for its attractive fragrant flowers, which are white or violet in colour. This plant is a native of central and southern Europe, but is an introduction in Great Britain and Ireland, where it is commonly encountered as a garden escape on waste ground, rubbish tips and river banks. It can be long established in some of these 'wild' situations, freely propagating by seed. 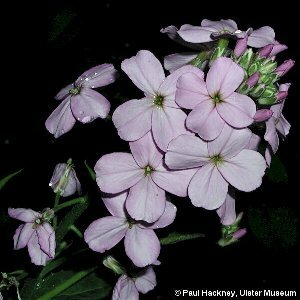 All names: Hesperis matronalis L.